Application: Chemical, cosmetic, food, beverage, pharmaceutical, etc. The double-spiral pump only moves the rotor synchronously, and there is no nail structure such as Teflon or rubber that it wants to contact. The unique dynamic rotary sealing structure of the double-spiral pump ensures a higher and more stable vacuum environment in the pump cavity. The direction of the double-spiral pump is the same as the direction of material flow. The extrusion, shearing and destruction rate of the material is very low, and the complete granular material can be basically transported. Twin-screw pump and conveying CIP CIP cleaning liquid back, and even if there is gas, it will not produce water hammer effect, and the equipment system can work normally. 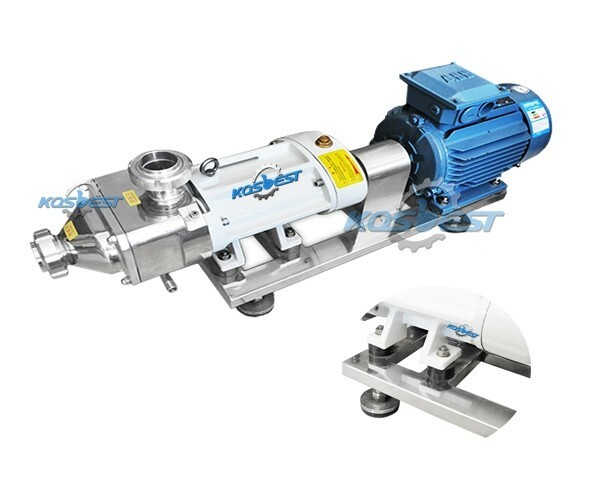 The double-spiral pump not only stabilizes the high-pressure output, but also can normally reach 16bar, and it can work normally even in the working environment with unstable particles, gas and flow. The double screw pump is a specially designed pair of helical systems that mesh with each other, which forming a series of dynamic surface between the sealing surfaces. Aplurality of sealing spaces are partitioned between the suction port and the discharge port of the pump due to the close engagement of the spirals with the inner wall of the liner. With the helical rotation and the teeth, these sealing spaces are continuously formed in the suction end of the pump to draw the liquid therein, and the suction chamber continuously low to the discharge end in the direction of the screw shaft, and the liquid enclosed in the individual spaces is continuously, smooth discharge, as if the nut in the spiral rotation is constantly moving forward. The gearbox is made of spheroidal graphite, cast steel and 304 stainless steel to further improve the hygienic level and performance of the equipment system. The transfer process is carried out by installing a synchronizing gear that is opposite to the drive shaft. The sealing surface forming a series of dynamic spatial curved surfaces between the spirals ensures the contactless and wear-free operation of the system from the design structure, thereby ensuring the trouble-free and long life of the equipment system. It can be used to transport large particles up to 29mm in diameter. Due to the speed range from 100 to 3000 rpm, the pump can transport highly viscous media and pure fluid medium. 1. The screw head after a special treatment, and making the screw head and the pump body can not to fit easily, also i can increased using life. .
2. Mechanical seal material using silicon carbide and cemented carbide, different materials can be selected single and double mechanical seal. 3. Shaft with alloy material, after special treatment to enhance the anti-pressures and corrosion resistance. 4. Gear box with 304 stainless steel, meet the food and pharmaceutical standards. 5. Bearings using the Japanese SNK material, can enhance the mechanical service life. 6. Synchronous helical gear internal and external grinding machine is processed, but the pump is used for positive and negative transfer, reducing noise and quieter operation. 7. O-ring with high temperature materials can reach more than 200 degrees. 8. Oil seal using imported UKS, high temperature working is available. 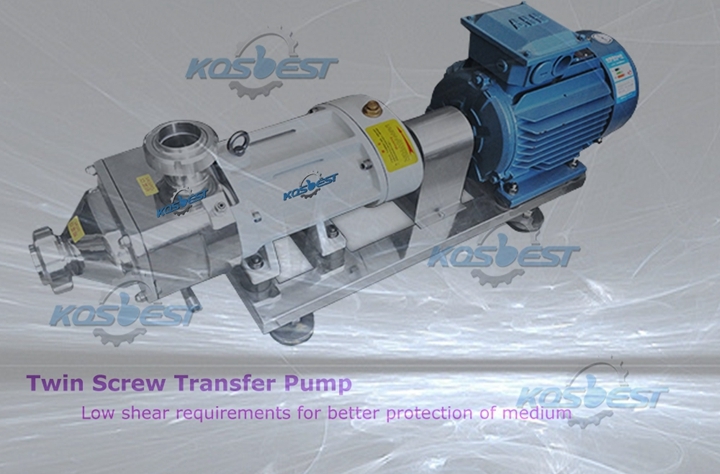 The twin-screw pump transfers the medium along the axis, so the shear to the medium is very low during transport. Because the inertial force of the rotating parts in the pump is low, therefore high speed is available, and the maximum speed can be reached to 3900rpm. 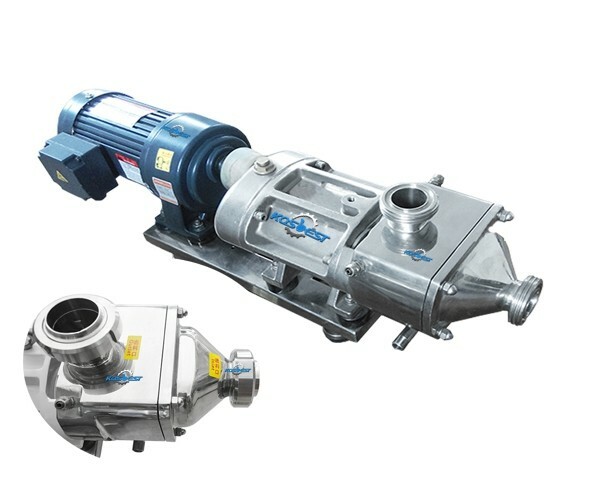 Compared with other rotary pumps, it is insensitive to incoming gases and particulate matter, and can be mixed with gas-liquid, solid-liquid. 7. If there is leakage in the shaft during operation, the pressure of the machine seal must be adjusted after the machine is stopped. If the process requires a working chamber, the jacket can be used to cool or heat the material. When starting up, the coolant or heat transfer oil is turned on first, and the working pressure of the jacket is MP0.2MPA, when processing materials with temperature requirements (such as chocolate sauce, etc.) ), must be heated or cooled to normal operating temperature and then turned on. The double screw pump is a specially designed pair of helical systems that mesh with each other, which forming a series of dynamic surface between the sealing surfaces. It is a transfer machine which can transfer the High concentration material or granular material. It is widely applied in pharmaceutical, Cosmetic, Food, Chemical Industies.